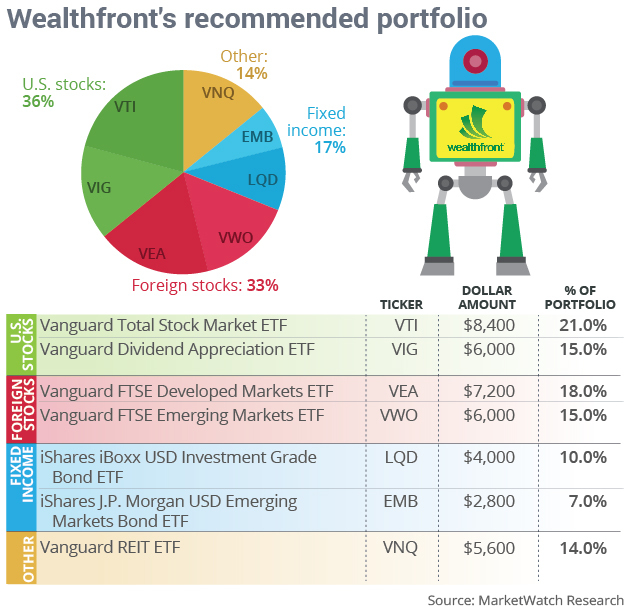 Keeping it simple: Wealthfront offers the simplest recommendation among the four robo advisers. It gets the job done with just seven ETFs, while the other three robots use 10 to nearly 20 different investments. But nonetheless, Wealthfront’s recommendation — 36% in U.S. stocks, 33% in international equities, 17% in bonds and 14% in real-estate investment trusts — is similar to rival FutureAdvisor’s suggestion to put 33.5% in U.S. stocks, 37.8% in overseas stocks, 16% in fixed income and 12.6% in REITs..
A $2 billion force: Wealthfront and competitor Betterment are the two biggest independent robo advisers, each attracting roughly $2 billion in investor money, according to data from an SEC tool for tracking investment advisers. A Goldman Sachs report dated April 10 said the nascent industry has the potential to attract about $400 billion eventually, but even that would represent a fraction of the $12 trillion that U.S. retail investors now have in play. Fees: Investors don’t pay a management fee for their first $10,000 at Palo Alto, Calif.–based Wealthfront, and above that amount the fee on assets is 0.25%.